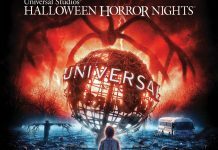 Home Universal Orlando Halloween Horror Nights - Orlando Universal Reveals Details for Halloween Horror Nights 22! 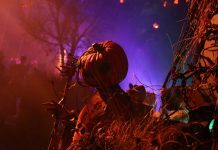 After months of speculation, several creepy phone calls, and weeks of social media teasing, Universal Orlando has revealed what will be horrifying us this year at Halloween Horror Nights 22. In a change to recent years, this year will feature 7 houses instead of 8. Also, Scarezones have been replaced by “Street Experiences”. The streets will be filled with ancient cemetery structures, vampiric hordes, barbaric warriors, and an all-female, chainsaw-wielding prison gang. According to Universal, there will be no boundaries, and no safezones. As usual, we will be treated to another year of Bill and Ted’s Excellent Halloween Adventure. No word yet on who will be featured in this year’s show. Gothic – The Catedral de Caementum Animus is, by day, undergoing a building-wide architectural refurbishment. By night, the many stone gargoyles that keep watchful eye over the sanctuary come to life with the mission of protecting this sacred place against intrusion. The Walking Dead: Dead Inside – There is strength in numbers, and you must band together to make it through many of the iconic settings made famous by the critically-acclaimed AMC television series, “The Walking Dead.” As the city is crawling with hordes of walkers, the issue of your becoming one of them is not a question of if, but when. Welcome to Silent Hill – In the eerie and desolate town of Silent Hill, ash falls from the sky and the physical laws of nature no longer apply. If you dare to venture into this alternate dimension, there is only one law of nature with which you must concern yourself: survival. Alice Cooper: Welcome to My Nightmare – Journey into the legendary rocker Alice Cooper’s twisted mind and witness the natural melding of horror and Cooper’s four decades-long career. Here you will follow Steven, the iconic character from many of Cooper’s works, as you come face-to-face with a myriad of tormentors who threaten an already-decaying sense of sanity. Penn & Teller: Newkd Las Vegas – World-renowned magicians Penn & Teller have accidentally nuked Las Vegas, but don’t worry, it’s nothing a fresh coat of paint and a truckload of BS can’t fix. Come on down to New Vegas, where all that glitters isn’t gold, and in fact probably has fatal levels of radioactivity. 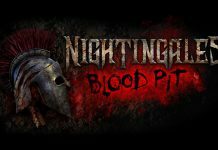 With a ripping, clawing and tearing through the concrete beneath Universal Studios come ancient cemetery Structures, spilling blood-raged, vampiric hordes that span the eras of time, barbaric warriors with a need to carve flesh from bone and an all-female, chainsaw-wielding prison gang. These and more nightmarish hellions inhabit every dark corner, foggy recess and shadowed path within the park. Unlike in years past, there are no boundaries. No safezones. No one escapes. The force of horror starts with The Iniquitus. Rooted in evil, these are the patrons of death and are the ones who rose from the cemetery. The Iniquitus are those who summoned the Dark Legions to come and feast here. The dark legions of horror that await are: Vampires – the blood-thirsty from all eras of time, Beasts – the legendary animal-like figures who prey on the unsuspecting, Warriors – a gang killed in a deadly war that has returned to seek revenge, Prisoners – these deceased chainsaw-wielding female inmates killed in a women’s prison fire are back… and angry, and Traditionals – the ghosts and goblins of Halloween past come together to feast.